At our Christmas concert on Dec 18th, the PAC held it's annual food drive for The Mustard Seed, our local food bank. Beginning last year, the PAC added the annual collection of cash donations, which are given to the administration and our Youth and Family Counsellor Emily Stark, to convert into grocery store gift cards, which are shared with families in need throughout the year. 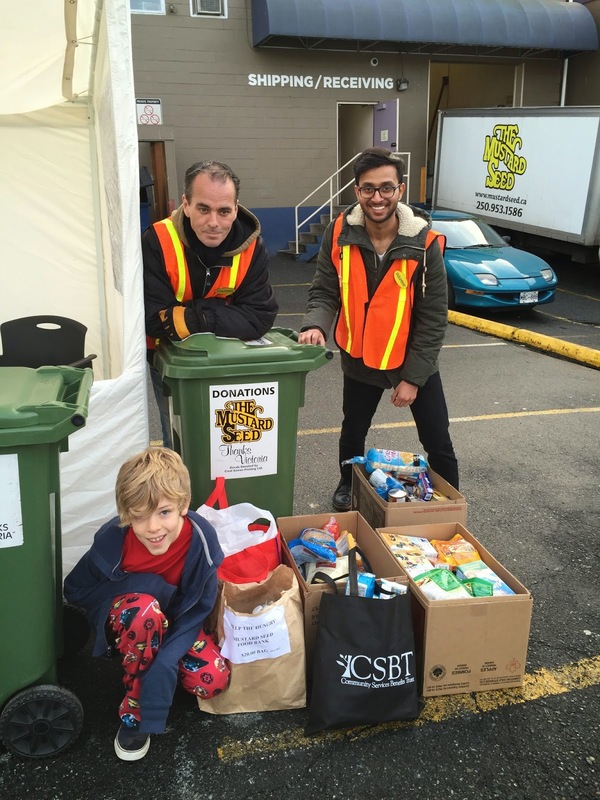 We are thrilled to let you know that not only did we collect over three apple boxes FULL of non-perishable food items for our greater Victoria community, but we also collected a whopping $325 for our own school's families. Thank you all so much for your generous donations. Every bit counts! Have a very safe and super fun holidays. See you in January 2015! The Vic West PAC recently held the first annual Silent Auction. Under the wonderful guidance of Shannon Ferguson, the auction included donated items from many local businesses and individual people in our community. It proved to be a great success, raising $1,480, which is all money that will go back into benefitting the school and students. Thank you to all those that bid on the items or even just came into the Vic West Community Centre to have a look at them, your ongoing support is truly appreciated. And finally, a very heart felt thank you to both Shannon Ferguson and Natalie McKay for volunteering so much of your time to make this event possible.